I would like to share Multipure Founder, Alvin Rice’s message to distributors and anyone concerned about the water they drink. Water is truly life essential. Every day we hear about how our water quality is compromised. Take action for you and your families health! Kick the bottled habit and filter your own tap water. 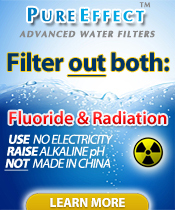 Multipure is the highest quality, most affordable home water filter. Let me start off by telling you how important you are to Multipure and how important Multipure is to good health. Every day, people purchase a drinking water filter simply because they do not like the taste of tap water or do not like the inconvenience of purchasing bottled water. Unfortunately, these people may not truly understand just how beneficial drinking filtered water can be to their health. In 2014, The Silent Spring Institute and the Harvard School of Public Health released the results of a study, entitled, “Biomarkers for Suspected Breast Carcinogens.” This study identified the highest priority toxic chemicals to target for breast cancer prevention, many of which were identified in tap water. Their recommendation? “Do not drink tap water.” Instead, they recommend that people should drink filtered water from a CARBON BLOCK FILTER. Every day, thousands of people purchase some kind of drinking water filter. Unfortunately, in many of these cases these people end up with systems of poor or marginal quality. When looking for an effective Carbon Block Filter, or any filter, the consumer can go to several sources to identify the product that is best for them. NSF/ANSI Standard 53 (health related contaminants). 2013 for below-sink drinking water systems. best buy in 2012 for countertop drinking water systems. Unfortunately, not all consumers do their homework. They don’t realize the differences in performance and quality among different water filters, and many end up purchasing water filters based solely on price, or what they see on TV, or what’s currently being promoted at the nearest hardware store. But at Multipure, we know that having a water filter is about more than just making the water taste better – it is about making your water safe and healthy to drink. Thank you for your continued support. Let’s make 2015 the year that everyone you meet has an opportunity for better health by drinking water from a Multipure Drinking Water System. Sheepskin is soft, warm and very durable. at the Comfysheep you will find the highest quality sheep skin products to keep toasty warm during cold winter days and nights. Imagine swaddling that new baby on a sheep skin mattress cover, or letting the little angle play on a soft cuddly rug in the nursery, The softest possible place for baby to sleep and play. Baby products are not the only thing the ComfySheep has. Oh no! How about a custom seat cover? The sheep skin covers are custom made of the highest quality sheep skin available. Guaranteed to fit your car or truck perfectly. Customers tell it all. Comfysheep carries the best sheep skin products. When only the best will do. Stockholm (2012-08-27) – Global leaders assembled today at the opening session of the 2012 World Water Week in Stockholm called for substantial increases in public and private sector investment to reduce losses of food in the supply chain, enhance water efficiency in agriculture and curb consumer waste. 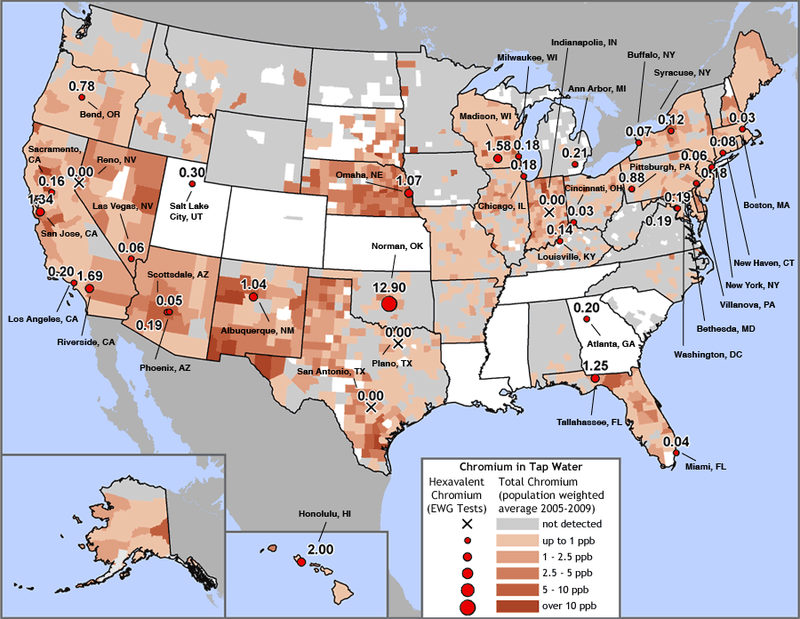 Laboratory tests commissioned by Environmental Working Group (EWG) have detected hexavalent chromium, the carcinogenic “Erin Brockovich chemical,” in tap water from 31 of 35 American cities. The highest levels were in Norman, Okla.; Honolulu, Hawaii; and Riverside, Calif. In all, water samples from 25 cities contained the toxic metal at concentrations above the safe maximum recently proposed by California regulators. Hexavalent chromium (or chromium-6) is a highly toxic form of the naturally occurring metal chromium. It is a well-known human carcinogen when inhaled, and recent evidence indicates it can cause stomach or gastrointestinal cancer when ingested in drinking water. A different form of this metal, trivalent chromium, is an essential nutrient. Exposure to hexavalent chromium commonly occurs through consuming contaminated water or food, as well as by breathing contaminated air in the workplace, especially for those working in metallurgy or leather-tanning facilities. Contaminated soil particles may also be a source of exposure via ingestion or inhalation. Widespread industrial use has led to detections of hexavalent chromium in two-thirds of current or former Superfund sites. How does it get into tap water? Hexavalent chromium can enter water through industrial contamination from manufacturing facilities, including electroplating factories, leather tanneries and textile manufacturing facilities, or from disposal of fluids used in cooling towers before 1990. It also occurs naturally in some minerals. The commonly used tap water disinfectant chlorine can transform trivalent chromium into toxic hexavalent chromium. Exposure in tap water has been linked to cancers of the stomach and gastrointestinal tract in both animals and people. California’s Environmental Protection Agency has released a draft public health goal based on the conclusion that levels of chromium-6 greater than 0.06 parts per billion (ppb) in tap water may increase cancer risk. Some people may be especially susceptible to the carcinogenic effects of chromium-6. Fetuses, infants, and children have higher sensitivity to carcinogenic chemicals. In addition, people with less acidic stomachs appear to have a limited ability to convert hexavalent chromium to trivalent chromium (chromium-3), exposing them to higher levels of the toxic form and putting them at greater risk. Using common antacids and proton pump inhibitors can reduce stomach acidity. Other conditions that can inhibit stomach acid production include infection with Helicobacter pylori (a common bacterium linked to ulcers), pernicious anemia, pancreatic tumors, mucolipidosis type IV and some autoimmune diseases. How can I find out if my tap water has hexavalent chromium in it? California requires water utilities to test and report levels of chromium-6 in their water. For Californians, this is a good way to see if this contaminant is a concern in your area. Unfortunately, these tests only measure levels at or above 1 ppb, more than 16 times higher than the suggested public health goal of 0.06 ppb. Of the 438 community water sources in California that have provided test data to EWG, 223 detected levels over 1 ppb and 93 detected levels over 5 ppb. This means more than 13.7 million Californians drink tap water contaminated with hexavalent chromium. Elsewhere, water utilities only test and report levels of total chromium — which includes both the toxic form and the essential nutrient chromium-3. These tests only measure levels at or above 10 ppb, more than 160 times higher than California’s proposed public health goal. If your tap water has detectable levels of total chromium, it’s quite possible that it has levels of hexavalent chromium that violate California’s suggested public health goal. The ratio of chromium-3 to chromium-6 varies for different water supplies, so it is difficult to estimate how much of each form might be in your water. Contact your local water utility or check EWG’s tap water database to learn if chromium has been detected in your tap water. My tap water has high levels. What should I do? If your tap water contains high levels, your best bet is to install a reverse osmosis water filter certified to remove this contaminant. Reverse osmosis filters, especially when combined with superior carbon filter technology, are best for ridding tap water of the largest number of contaminants possible. EWG provides a list of reverse osmosis water filters certified to remove hexavalent chromium and available for purchase on Amazon. See EWG’s water filter buying guide for more information on how to select a water filter. While drinking bottled water might seem like a good way to avoid exposing yourself to hexavalent chromium in tap water, there is no guarantee that bottled water has lower concentrations of this contaminant. If you drink bottled water, choose brands that provide water quality information indicating their water has levels of chromium-6 below 0.06 ppb or that use reverse osmosis filtration to treat their water. Because infants can be especially sensitive to carcinogenic chemicals, it is particularly important to use safer water when preparing infant formula. Water treated with a reverse osmosis home filter will contain fewer contaminants and be safer for babies. Can I test my own tap water for chromium-6? Most commercial water quality laboratories do not offer this test. Besides drinking water, how else can I be exposed? Other sources of exposure to hexavalent chromium include contaminated food and contaminated workplace air, especially for those working in metallurgy or leather-tanning facilities. Contaminated soil particles may also be a source of exposure via ingestion or inhalation. Widespread industrial use has led to detections of chromium-6 in two-thirds of current or former Superfund sites. Are some people more vulnerable to the effects? Yes. Fetuses, infants, and children have a higher sensitivity to carcinogenic chemicals. Their developing organ systems are more susceptible to damage from chemical exposures, and less able to detoxify and excrete chemicals. In addition, people with less acidic stomachs appear to have a limited ability to convert chromium-6 to chromium-3, exposing them to higher levels of the toxic form and putting them at greater risk. Using common antacids and proton pump inhibitors can reduce stomach acidity. Other conditions that can inhibit stomach acid production include infection with Helicobacter pylori (a common bacterium linked to ulcers), pernicious anemia, pancreatic tumors, mucolipidosis type IV and some autoimmune diseases. What other chemicals in my tap water should I be concerned about? Check out EWG’s tap water database for an in-depth look at water contaminants, including drinking water quality information for 48,000 communities in 45 states and the District of Columbia. What is EPA doing to promote safe drinking water? Not enough. In the case of hexavalent chromium, the EPA has taken no action to specifically limit levels of this toxic compound in drinking water. The agency has left in place an inadequate standard for total chromium, set nearly 20 years ago, that does not distinguish between toxic hexavalent and nutritionally essential trivalent chromium and cites “allergic dermatitis” as the only relevant health concern. The agency has not set a new, enforceable drinking water standard for any contaminant since 2001. Recently the federal government has begun to focus a critical eye on chromium-6 and other water contaminants. EWG recommends that the EPA set a legal limit for hexavalent chromium in drinking water as quickly as possible and require water utility testing to assess exposures nationwide. Millions of Americans are at potential risk from Chromium VI contamination in their drinking water. Homeowners can protect themselves from the contaminant with a Multi-Pure drinking water system. New reports from the Washington Post and the Environmental Working Group (EWG) indicate the suspected carcinogen is more widespread than previously thought – appearing in the drinking water of 31 major cities across the US. Chromium six (Cr (VI), hexavalent chromium) is a metal species that is capable of causing cancers in laboratory animals and is considered by the US Environmental Protection Agency (EPA) a likely a human carcinogen. Multi-Pure International is the manufacturer of home drinking water systems which are certified by NSF International to reduce levels of hexavalent chromium. Cities found to have the highest concentrations of hexavalent chromium are Riverside, CA, Norman, OK, and Honolulu, HI. The full list of cities where the contaminant has been detected can be found in the EWG report at www.EWG.org. Despite mounting evidence of its toxic effects, the EPA has not set a legal limit for hexavalent chromium in tap water nationally and does not require water utilities to test for it. According to the Post, the state of California has taken the first steps in limiting the amount of the contaminant in drinking water by proposing a “public health goal” for safe levels of 0.06 parts per billion (ppb). Some industry experts indicate this level may be unrealistically low, citing limitations of the EPA’s analytical methods in detecting such low concentrations. Multi-Pure International is a leader in the drinking water industry. Celebrating 40 years in business in 2010, the company manufactures and distributes drinking water systems and components from Las Vegas, NV.